This is the second children's book that I've read this year (the first one was The Inn Between) that frightened me more than any Stephen King novel I've ever read. More than any adult horror novel I've ever read, to be frank. And I wonder if it's just the story, or the fact that the story is intended for kids and I cannot imagine ever reading this as a child. I mean, I read about horses. And I read Animorphs. The only Goosebumps book I read scared me so much that I wanted to bury it in the backyard. I did not do this, as a classmate had loaned it to me and you just don't do that to other people's books, no matter how strongly you were convinced that it was completely real and would haunt you in real life. Now, I'd like to think I'm a bit more, mmm, how do I say it? Not tolerant. Intrigued by the dark side of human nature. And really, isn't that what good horror is all about? The twisted, nasty things inside of us? 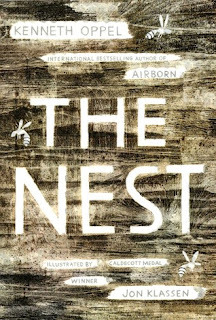 Kenneth Oppel's The Nest may certainly be read as an allegory for some sort of wickedness within, but at my core, I truly believe that it should be read straight, with no delving into symbolism. I believe that this is possibly one of the scariest books I've ever read. And that will definitely make it popular with the kids at the library! If you're expecting something along the lines of Airborn or The Boundless, um, go read those books. This Oppel is one I've not yet met (although I've also not read his Victor Frankenstein series). Instead of a breathtaking adventure, he gives us a terrifyingly claustrophobic exploration of nightmares and magic. With wasps. Steve's life is complicated, to say the least. His baby brother is fighting to stay alive, his parents run to hospital and go to support groups, and his sister Natalie is talking to the imaginary Mr. Nobody on her toy telephone. After an unfortunate encounter with a wasp and a trip to the emergency room, Steve needs to carry an Epi-Pen and is supposed to get allergy shots. But his dad is too busy with the baby to call the doctor about Steve. So one night, after burrowing under the covers to ensure that the dark figure who occasionally appears at the foot of his bed cannot reach him, Steve awakes to a dazzling sight: luminous beings who promise that they've come to save his baby brother. At first, Steve keeps the presence of the angels a secret--who would believe him? But as his dreams become more frequent, the number of oddly-colored wasps buzzing about the house increases as well. And the Metal Man who sharpens tools in his creaky old van comes by and rings the doorbell. Who really means the family ill? And just what did Steve promise when he said that the angels should fix his baby brother? The dream-vision clears, and they are not angels, but wasps. Steve has been speaking with their queen. They are building a brand-new baby inside the wasp nest lodged under the eaves. They perform this "service" often--replacing "broken" babies with brand-new, perfectly-constructed ones. So when Natalie's toy phone rings with messages from Mr. Nobody for Steve, and the Queen tells him that the "broken" baby simply can't be allowed to exist, and that she can fix him, too, Steve must fight. Armed with a magical sickle, he enters a realm of quiet horror that's unlike anything I've ever encountered in kidlit before. I cannot describe how or why, exactly, this frightened me so. Perhaps it was that Steve's parents didn't believe him--but then, if your child was telling you that evil, giant talking wasps were threatening to kill your baby brother, what would you do? Steve is helpless and alone, and that's what the wasps prey upon. There was one factual quibble I had with this book, and that's that Steve knows he is supposed to inject his Epi-Pen into his wrist. Um, if he did that, it would not be good. Epi-Pens go in the meaty part of the thigh. I accidentally auto-injected my Epi-Pen into my thumb as a teenager and almost lost it, because the high concentration of adrenaline stops circulation. Let's just say very long needles were involved. Do not stick your Epi-Pen anywhere but a nice, fleshy area. 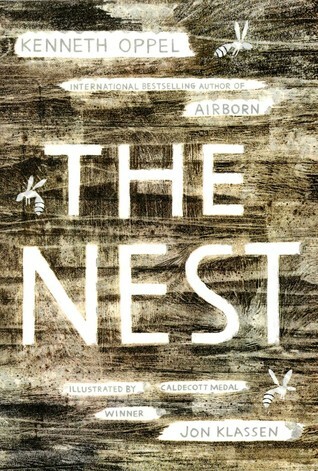 The Nest reminded me a lot of David Almond's Skellig, but the evil wasps made it a million times more terrifying than the sweet melancholy of Skellig. There's not enough of Klassen's art in the book to really make it worthwhile for his fans, either. Just a few panels scattered throughout. Readers of Goosebumps who are looking for something a bit quieter but no less freaky will love this. Goodness, that does sound scary! I guess it will keep kids away from wasp nests, anyway. ;-) I read a few Goosebumps as an adult and didn't find them too scary. I asked a Year 7 child, who said, "Yes, I know, but they were all we were allowed to read at primary school." The older kids much preferred Stephen King, though nobody has asked for his books in a while. Plenty of YA horror fiction. I hand out Goosebumps books like candy on Halloween to 3rd/4th graders. I'm glad to have this one as a backup. Ugh, whenever I see the beginnings of a wasp nest I freak out and get someone else to get rid of it. I understand that they need a home but ... not near the library entrance, which was the last place I found one.